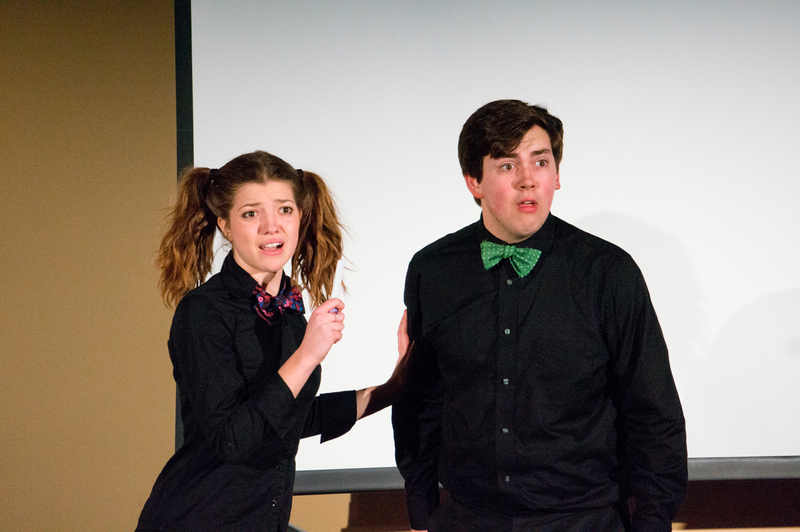 Friday and Saturday evening, Scotch ‘n’ Soda daughter organization Tisbert Sketch Comedy put on its spring show. Modeled after some classic kids’ shows, Sketch by the Foot combined an amusing plot line surrounding the cash-strapped cast of the titular show with Tisbert’s usual mix of sketches about completely mundane situations gone mildly wrong in hilarious fashion. Each transition featured an updated remix of theme music from children’s shows from 15 to 20 years ago. The night opened with first-year Dietrich College student Briana Hudock explaining that Tisbert Inc. had fallen on some hard times and that, to get by, they needed help from their new “friends” — “can you say corporate sponsor?” — Go-Gurt. The ancient yogurt-like snack tube … things … made frequent appearances and added a late ‘90s to early 2000s feel that fit the backdrop of the show nicely. Hudock’s monologue drew heavily on similar opening scenes from the always-relevant Dora the Explorer, the first in a series of blatant homages to the Nick Jr. classic. The cast then came on and introduced themselves in a way reminiscent of Zoom and other similar shows from the turn of the millennium. First-year vocal performance major Russell H. Holbert even introduced himself with a middle initial, a necessary element of such a throwback. Each character had their own kids’ show archetype and accompanying explanation, featuring a “cute leader,” a “tough one,” a “smart one,” a “crazy one,” and, of course, the cast baby. By this point I was fairly worried I was going to see an endless round of gags on the shows I barely remember from my childhood, but luckily there was much more in store. One of the high points of the show was easily a bit of fan service delivered by senior electrical and computer engineering and creative writing double major Brad Plaxen and senior BSA student Alex Petti. After a benign collision, the two lost their shirts and nearly came to blows before realizing that fists is not how they fight at this particular bar. Each then donned a cowboy hat, and, as Hudock counted them in, took three steps back in an old west style shootout. After a quick victory, Plaxen jumped onto junior BHA student Sam Riordan’s back and declared “Welcome to PHI,” a tribute to Carnegie Mellon’s favorite bar. The show was not without its missteps, though. One scene, featuring girl scouts whose troop leader was replaced by some sort of military character, was funny but ultimately fell on its face. Hudock, Holbert, and Riordan excellently portrayed terrified girl scouts and nearly saved the scene as Petti, their new troop leader, attempted to scare them into being more efficient salespeople. Petti, however, did not help matters. His character featured an accent that seemed like it was going for Vietnam War Veteran, but only made the scene kind of awkward. Even his last quip about becoming addicted to black tar heroin in Vietnam was misplaced, weird, and somewhat confusing. In addition to some of the more shameless rips from popular culture, the more original features of the kids’ show setting were excellent. As the audience entered Porter Hall 100, they were asked to write letters to the cast members. Plaxen, for some reason the only cast member not wearing a solid black shirt, sat down on a stool with the letters by his side and read some of them. Two were scripted, but Plaxen navigated the pair of bizarre and unscripted letters he did pick up seamlessly, managing to both draw on his role as “the tough one” and accidentally let slip that Tisbert Inc. was actually the Illuminati. The Go-Gurt soaked adventure through the TV show ended when the product placement cash was not quite enough to keep the lights on through the duration of one last song and dance. But while it lasted, Sketch by the Foot, when it hit, showcased more of Scotch ‘n’ Soda’s talent for escalation and absurdism. As the cast — and totally not Dora the Explorer — would say, muy bien!